Getting your data into hands of the public has never been easier. 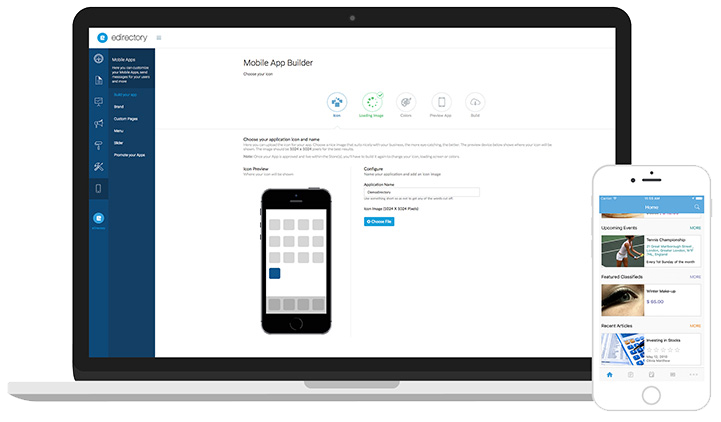 Build your own app inside the site manager and have us automatically build it for you. It's easy like that! No Code Knowledge Required, Native Apps All Day! With our cleverly designed mobile app builder, creating your Android and iPhone apps is a piece of cake. You pick the colors, upload your images, build it, and share to your community! The apps are connected live to your eDirectory database. If you would like to run the build and submit to the stores, order our Build and Submit service, and we’ll do all the work. Get your own app in the App Store with eDirectory. 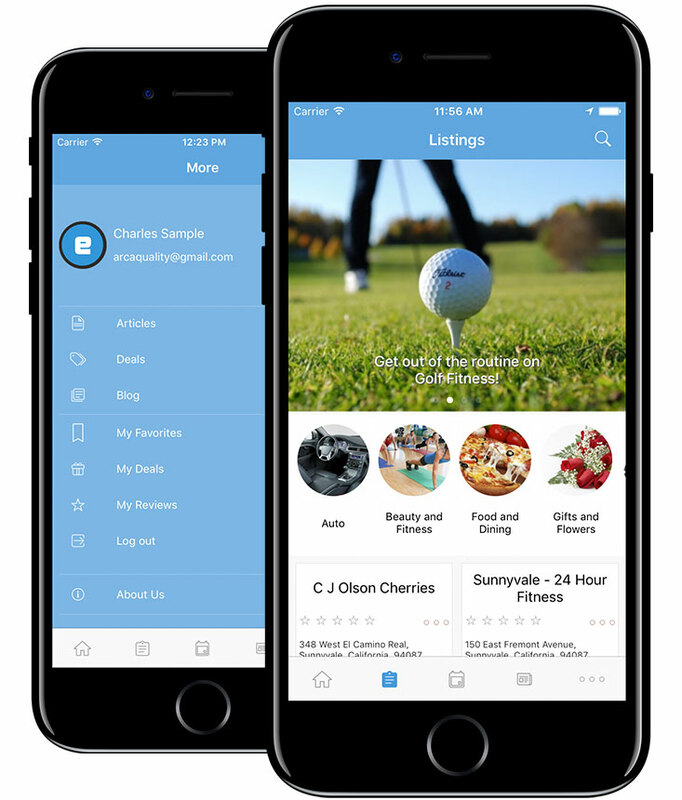 As you are building the app, you can customize the app with your own branding and can decide which features to use. Then, you can take your freshly-built app and upload it into your own App store account. The eDirectory iPhone platform features a clean design, which adheres to the iPhone interface design standards. Data updates to the website are reflected in real time on the app. The app has great features, like location awareness, directions, and click to call. Configure and build your own Android app right from the Site Manager, and submit to your own Play Store account. 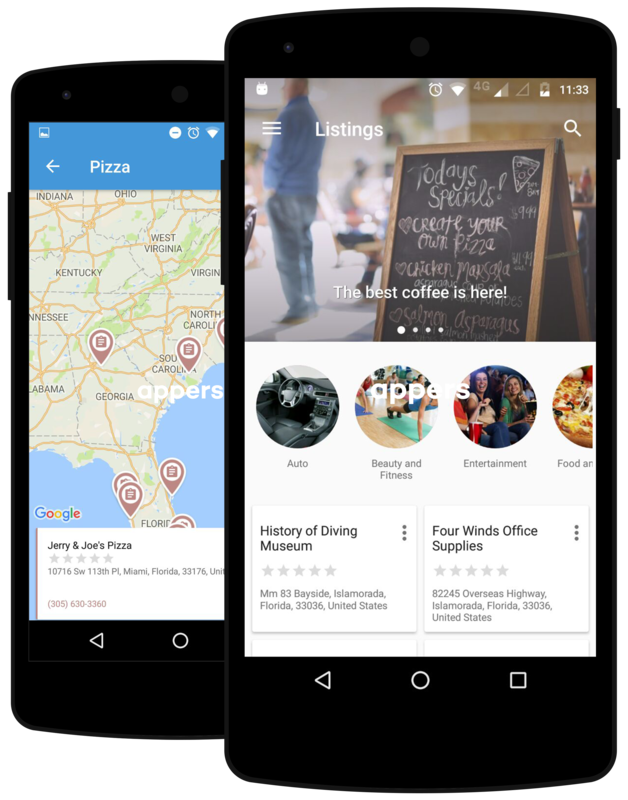 The Android app also updates data in real time from your eDirectory database, so listings and reviews are never out of sync. It features a design matching the Android interface guidelines, and was built with fully native code, giving you smooth page transitions coupled with great performance. We have a Build & Submit service, where we build and submit both iPhone and Android Apps. Save time and focus on building your business. The app builder's simple interface allows you to pick which features to include in the app, select colors, and upload your graphics. The app has a real time connection with your database, so your content is always up to date. Unlike web-sites, iPhone and Android apps need to be compiled, which turns your configurations and the native code into the app. Luckily the eDirectory app builder has a simple web interface, and typically in under 5 minutes, your app is ready to go. After your build files are ready, you can download them from the web interface and submit them to your own Play Store Account for Android, and App Store account for iPhone. Check the Pricing & Orders page for a breakdown of our pricing structure. If you like what you see, sign up or simply try out the online demo first.